How Do You Get to Grand Army Plaza, & What Happens There? Grand Army Plaza is a large plaza at the intersection of Flatbush Avenue and Eastern Parkway, where they meet the entrance to Brooklyn's major public park, Prospect Park. Complete Guide to New Year's Eve Fireworks in Brooklyn. Grand Army Plaza is marked by a large, one-way traffic circle. In the area surrounded by the traffic circle is a large and beautiful arch, and a fountain area. Confusingly, Grand Army Plaza is also the name of a subway station nearby in Park Slope that is served by the # 2 and # 3 subway lines. Manhattan also has a Grand Army Plaza. It is near the old Plaza Hotel, in midtown Manhattan. Or, take the Q or B to the 7th Avenue Station. Follow Flatbush Avenue up the hill. Grand Army Plaza is about 3 blocks away. 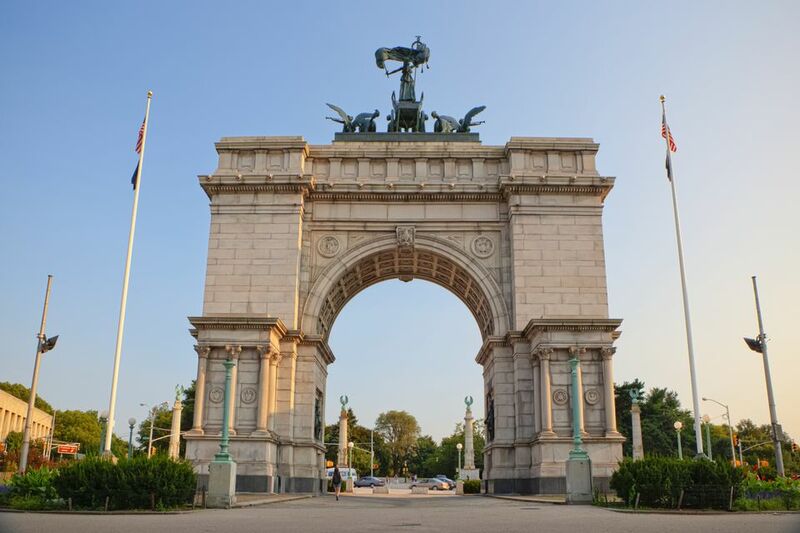 Several important cultural institutions and architectural monuments are associated with Grand Army Plaza, including the Brooklyn Central Library, Prospect Park, and the Soldiers and Sailors Memorial Arch, which resembles the Arc de Triomphe in Paris. The Brooklyn Museum and the Brooklyn Botanic Garden are within walking distance. A large, weekly, year-round Saturday greenmarket occupies part of Grand Army Plaza. Since 2011, this site has also been used on Sundays for a Food Truck Rally that is open in the spring, summer and autumn. Grand Army Plaza is a popular place for wedding photos, and, occasionally, movie shoots. During the summer, concerts organized by Celebrate Brooklyn and held in Prospect Park often reference directions from Grand Army Plaza. Grand Army Plaza is home to one of the world's largest Hanukkah menorahs, which is erected temporarily and is lit every night of the eight-night Hanukkah festival, usually in December. It is about 30 feet tall. Grand Army Plaza is often considered part of the Brooklyn neighborhood of Park Slope, but it's actually in between Prospect Heights and Park Slope. On New Year's Eve, Grand Army Plaza is the site of festivities and entertainment before the annual, and very popular, midnight firework display in Prospect Park. For information on the history of Grand Army Plaza, and the various monuments in it, click here.